My cat Mio is one of the strangest cats I've ever encountered. She's only six months old but I can already tell this is going to be a fun journey for her and me. She licks me. All the time - one day she licked my whole hand, literally! When she eats she scratches at the carpet like she would if she were using the litter box. She likes to sleep next to my head. Past cats I've owned barely slept with me at all. If I am laying on my back she will lay on my stomach in between my breasts. If I am on my side she will lay on my side, honestly, right on me! She'll sleep with me the majority of the night. When she lays down to relax she spreads out on all fours - I don't know if it's because she is getting fat or what. She absolutely hates when people touch her stomach. Last but not least she will lay on my phone if I look at it too much. She will distract me to make me get up, and she'll be laying on my phone. Or (like right now) she keeps walking in front of my phone screen and rubbing her head on mine. She is a crazy, all around attention-seeker. I thought I just had a weird cat but apparently it runs in her family! I love the way Mio's lying in your photo, Kaysha. I don't think it's just Siamese cats that do that although a lot of Siamese also seem to lie that way. I don't really know why they do it, either, but somebody's bound to let me know! With her white back feet she looks a little like a Snowshoe - does she have white front paws as well? Cats tend to scratch around their food bowls if they don't finish all the food in it - in the wild they'd probably bury any leftover food and this indoor behavior is their way of 'burying' their leftovers. My own cat sleeps on the bed with us (he thinks of it as his bed!) and will often sleep right on me, too - for some reason, he doesn't often sleep on my husband. Mio's very pretty - I love the expression on her face in your picture! My Balinese, Cous Cous, did the same thing with a laptop I like to use, he'd simply either sprawl over the keyboard when I used the thing or lay on it when it was folded up. I got the message. I still can't figure out how with less than 5 seconds to push keys he would cause an hours worth of me sorting through the maze he made of whatever I was doing. Rebooting was usually the only solution. My cat, Vader, lays down like Mio in the picture, only she will stretch her back legs straight out behind her and close her eyes. We call it her Superman pose because she looks like Superman flying. Mio is not as strange as you might think, Siamese are characters in their own right and usually develop their own set of habits, meant only to please themselves! As for bed, ours likes to lie on top of my wife for a while but cuddle up closely to me to sleep, by my head or in the crook of my legs behind my knees depending on his mood. His purring is almost inaudible but I can feel the vibration and when that stops I know he is sound asleep. However he absolutely loves having his tummy stroked and tickled, he positions himself on my lap and arranges my hand to be in the right place to stroke and just drifts off into his own little world for hours - or until I stop stroking when I get a claw or two lightly placed on the back of my hand to operate the started button again. He scratches the floor when he comes across anything he doesn't care for, I think he's trying to bury it. Lastly if he is not getting the attention he thinks he deserves then he will identify what is occupying my attention and then attempt to sit on it (mouse or phone) or in front of it (screen) making a nuisance of himself until he gets his cuddles. He's now eight, and getting set in his ways, but we love his quirky ways and the lengths he goes to make sure we know how much he loves us too. By the way, he has two pink carrots which he adores, wherever we are, the carrots are nearby and he carries them to bed shortly before we go so that they are placed on the bed for us. I've never known a cat before to like to share his toys so willingly. 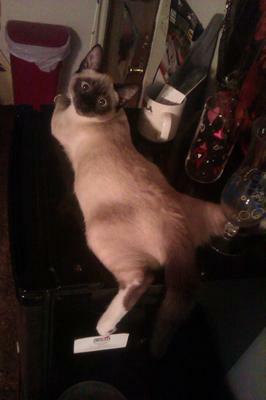 If you read my earlier stories, you'll see that he is the survivor of our second pair of Siamese in 30 years and each one has a completely unique character that is irreplaceable and that is what I find so attractive about Siamese. Note from Caroline: Gwyn's own story of his most recent cats, Nibbles and Boo, can be found here and of a pair of earlier cats in Generations of Siamese. It's good to see you popping in, Gwyn! Over many years I've lived with different Meezers, no. 4 just moved in and every one of them has insisted on sharing the bed. Three of them had to sleep by my head (thankfully it was just one at a time), I got used to the steady and usually loud purring. That isn't just your bed any more, Mio now shares hers with you.